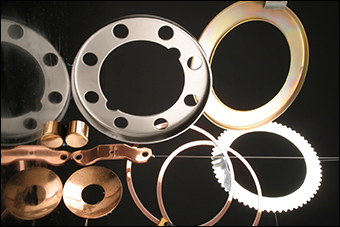 Capabilities in press work cover simple punching and blanking of washers, spacers, gaskets, core plugs and similar products. 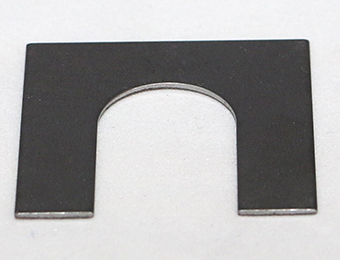 These range through to high volume double die production of aerospace standard components. The press capabilities incorporate a combination of both hand presses and power presses, allowing for the production of very small batches through to large production runs. 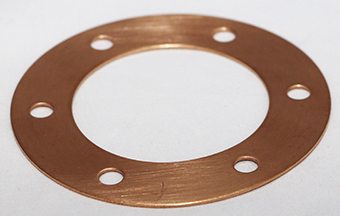 This washer is manufactured from phosphor bronze at our High Volume cell; the part is produced in one hit on an automatically fed press and rumbled prior to shipping to our Customer. 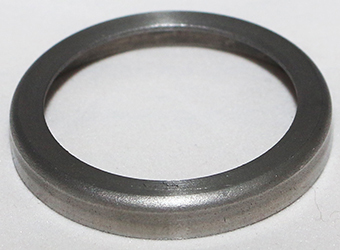 Spring discs, because they are normally used in sets have several critical requirements such as height and hardness, this particular example is produced on our heavy presses, it is then sent for heat treatment and has a final rumbling opporation to remove any sharp edges and ensure the part is clean. Metal inserts are mainly produced at our high volume factory they are produced in one operation, and rumbled prior to dispatch. This small standard type tab washer is pressed and formed complete at our High Volume factory then zinc plated and clear passivated. 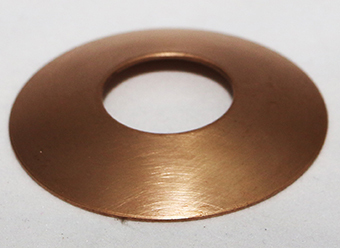 Copper washers are made in large batches, these particular ones produced at our High Volume site are pressed and annealed on site before being despatched to the Customer. Aluminium fins are produced in a single operation, the fins are then dried (the oil used is evaporated) prior to inspection, packing and delivery. 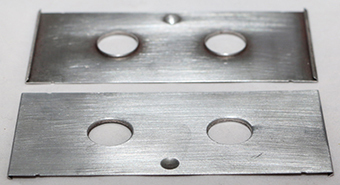 Standard Locking Plates can be produced several ways usually depending on quantity required, this example is pressed, then subcontracted to be zinc plated and passivated. 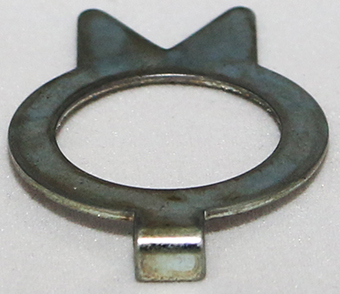 These copper zinc alloy fuse caps are produced in a single operation, they are then rumbled and inspected. 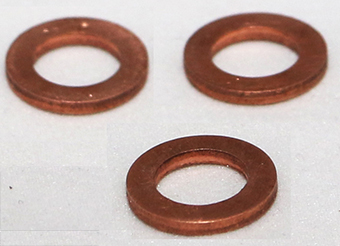 The phosphor bronze Spherical Washers are produced in one hit, dimples are added to the underside at the same time that the parts are pressed, the sharp edges are then removed and the parts inspected. Belleville washers are manufactured at or North Shields site, they are pressed, then sent for sub contract heat treatment before being finally rumbled and inspected. 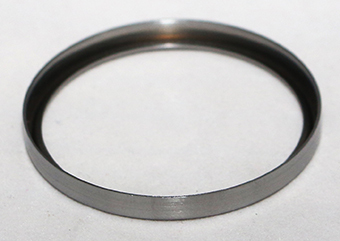 Hose seals, although they have scalloped edges are produced by exactly the same method as plain edged seals, they are pressed in a single operation, inspected and packed. 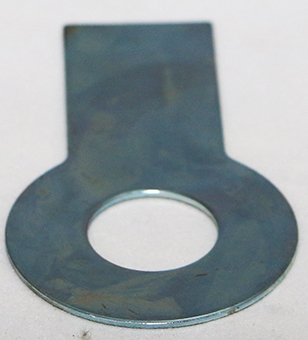 This type of shim can be produced by laser or press, this particular example is has a natural finish but often they are provided with a plated finish. 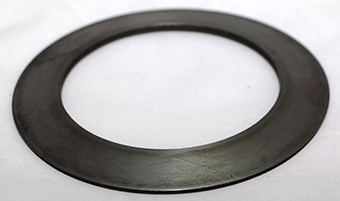 Oil seals, also referred to as metal inserts, are pressed / formed at our North Shields site again in a single operation.